In just a few hours we’ll be seeing some you right here at SDCC 2018! Make CBLDF your first stop on the floor at Booth #1918! 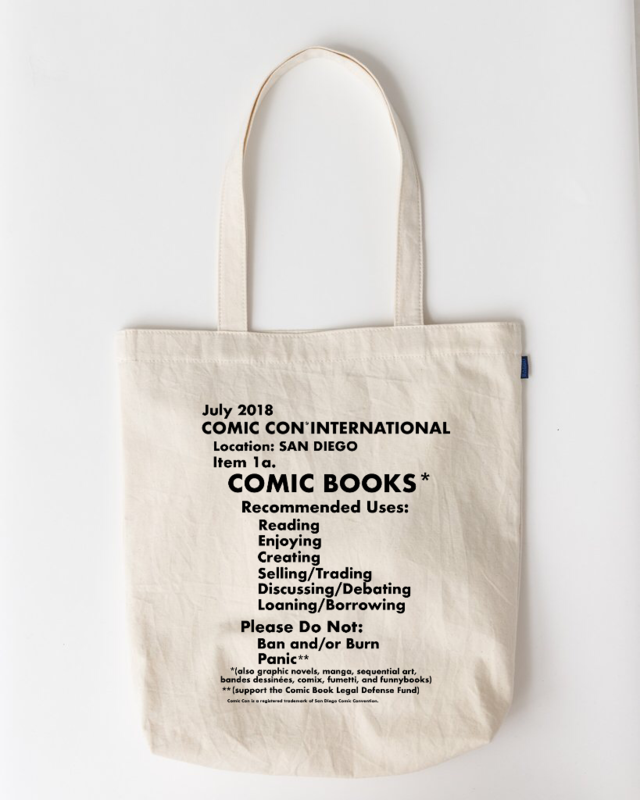 Grab a free copy of CBLDF Summer Update 2018 and the exclusive Comic-Con Comic Book Fact Sheet Tote so you have a place to put all your first day goodies! There’s a lot going on over the next few days, so make sure you mark your calendar with everything you want to do with CBLDF! It’s hard to believe now, but comics used to be the black sheep of reading! This powerful language was once synonymous with juvenile delinquency and bad reading habits. But today, they’re at the center of pop culture! Just because graphic novels are popular, that doesn’t mean everyone knows how to use them in their library. Don’t fear, CBLDF is here! We’ll help you make the most of this incredible creative medium for all of your patrons! Come learn about CBLDF’s new research on cataloging comics and helpful tips about collection development and defense that will help everyone in your library love comics! Panel moderated by CBLDF Board member and Sequential Tart founder, Katherine Keller. Panel guests include Hallie Clawson, one of the researchers behind Comics – Start Here! ; Chloe Ramos-Peterson, previously a librarian in Oakland, CA, now working with Image Comics; Chris Butcher, from Viz Media and the Toronto Comics Art Festival; and Carla Reimer, a school librarian, and one of the Organizing team members for ALA’s Graphic Novel Round Table. 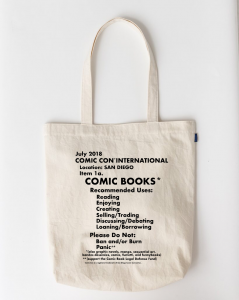 Get a global look at comics censorship from CBLDF! Learn about current censorship challenges in the U.S., including new bills attempting to regulate internet use, and the abundance of local challenges to comics addressing diversity and equality. Explore how cartoonists are being prosecuted, threatened, and intimidated by authorities around the globe for making art. Learn how you can participate with CBLDF in making a difference and standing up for free expression! CBLDF Executive Director Charles Brownstein leads the conversation. Also make sure you’ve already gotten your tickets for the hottest party at comic-con, the annual CBLDF Welcome Party! Free for CBLDF members! Hobnob with the best creators and comics professionals. Preview the amazing art up for auction to benefit Comic Book Legal Defense Fund. Fight censorship and smell great doing it with a special gallery set up by Black Pheonix Alchemy Lab, featuring scents designed specifically for CBLDF, available for one night only! Get your tickets right now! Keep up with the latest CBLDF and SDCC developments by following us on Twitter, Tumblr, Facebook, and Instagram! Or to get updates delivered right to your inbox, sign up for our weekly newsletter at CBLDF.org!